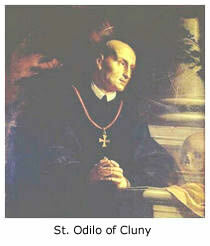 Our Patron: St. Odilo of Cluny. The Church has always encouraged prayers that the deceased may be received into Heaven, but only in the second millennium of Western Christianity was a special liturgical day set up in the interest of the Poor Souls. Around 1030, Abbot Odilo set aside November 2 as a day for the special commemoration in his own monastic community for the souls in Purgatory. He started this as an observance for the monks of Cluny and all the other communities in the Cluniac family, requiring them, on the day following All Saints, to pray for deceased monks. He strongly exhorted all the monasteries under his jurisdiction to devote this date each year to Masses, acts of self-denial, and almsgiving on behalf of the souls in Purgatory. The practice soon grew into the custom of saying three Masses for the souls in Purgatory. Eventually Rome officially extended to the whole Western Church in 1748. After the First World War it developed into a universal observance, with one Mass being said for a particular person or group, on for all the dead, and one for the pope's intentions. with angels releasing souls from purgatorial fire. He is invoked on behalf of souls in Purgatory. St. Odilo's life provides a good illustration of the vast contributions that religious orders have made and can make to the Church and to the whole world.